DXPedition in Patreshko village, 73 from Georgi and Ivo. Strong signal with overmodulated audio, SINPO 44554, QRM RTTY on 11598.
from 0315 to 0410 on new 6205, ex 6245. SiNPO 44544. KOREA NORTH(non)   New frequency of Furusato no Kaze via Koror, Palau. 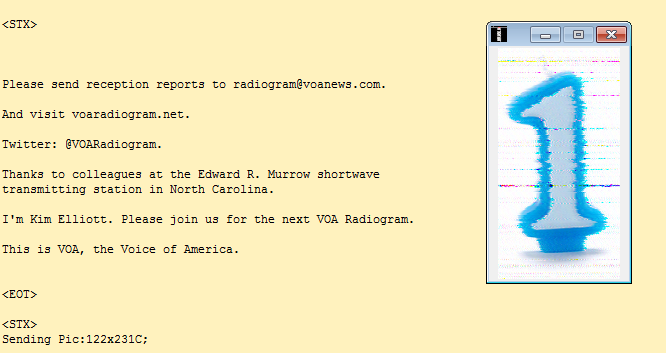 Very good reception of program #52 “battle of the 100-word-per-minute modes” of VOA Radiogram between 1930 and 2000 UTC on 15670 kHz out of Greenville Site B. The modes used were: MFSK32, PSKR125 (110 wpm), MT63-1000L (100 wpm), Thor25x4 (100 wpm), MFSK32 (120 wpm), MFSK32, MFSK32. The programmes are mainly in Swedish and hosted by Ronny Forslund. Short announcements in English and German will also be included. Reports of reception can be sent to SDXF, Box 1097, SE-405 23 Göteborg, Sweden. For QSL response please enclose some form of return postage. The Mighty KBC is not moving to 9925 kHz, but staying on 7375 Khz until May. This is only for our broadcasts to the USA, Canada and South America. (This show is recorded, so we will be mentioning the wrong frequency on our Transmission). Transmissions are jammed by Ethiopia with white noise like broadband DRM. * probably 13860 is a test for summer period from March 30. Thanks to Glenn Hauser and Wolfgang Bueschel for this info in WOR#1712. Thanks to David Kernick, which determine the name of Cambodian station. Kotirava NHK Wardo Radio Nippon Tokyo and then music. Very weak in Sofia. The DRM transmission went on after 1600UT. Nothing from Voice of Nigeria on March 18. * to avoid Voice of Tibet in Chinese 1330-1400 on 9338 and CNR-1 on 9340. UZBEKISTAN   CVC Voice Asia will probably leave shortwave from March 30. The DRM transmission went on after 1600 UTC. 1129: Excellent signal from IRRS Milano on 9510 kHz with "Word for the World" Bible program. 1134: Very strong signal from Radio Belarus on 11730 kHz, but undermodulated and buzzy audio, as always. Does anyone care what is the quality of the shortwave transmissions? 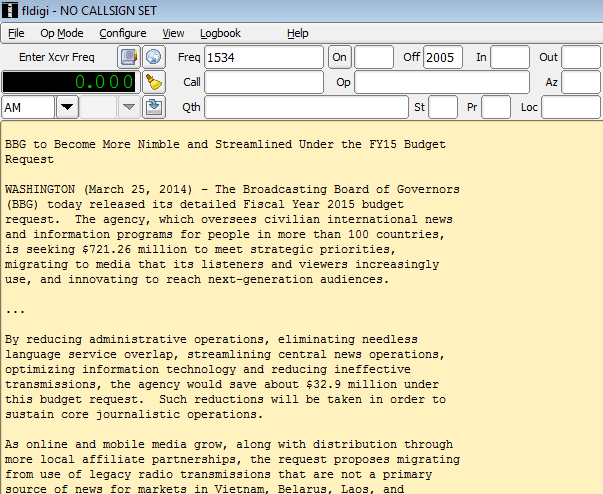 1137: News bulletin in Uzbek on 13625 kHz. Excellent signal and audio quality. Doubtless, it's Voice of Turkey, 500kW out of Emirler, directed to Central Asia. 1138: Weak Chinese music on 13645, a bit stronger than the local noise level here. Frequency lists show this is China Radio International in English, Kashgar/100kW, directed to South Asia. My QTH is well off the angle of this transmission. 1142: Weak to fair signal from ItalCable on 15000kHz. Playing Italian music. 1143: All India Radio in Tamil on 15050 with traditional Hindustani music. Weak signal. 1143: Radio Romania International putting excellent signal in French on 19 meters band (15150 kHz - 55555) and fair to good signal on 15255. The 16 meters band broadcasts are much weaker as I fall in the skip zones of Tiganesti and Galbeni transmitter sites. 1145: Football commentary in Turkish on 15350 kHz. It's Voice of Turkey, of course, once again. Excellent signal on parallel 15480, as well. 1146: Firedrake jammer on 15375, atop of much weaker Radio Free Asia in Tibetan. 1150: Weak signal with gospel music on 15605 kHz. It's Adventist World Radio from KSDA, Agat, Guam. The language of the transmission is Shan, spoken by more than 3 million people, mostly in Shan State, Burma. I wonder how many of them do actually listen to KSDA's broadcasts. 1152: Chinese music on 15670 kHz. It's CNR-1 Jammer against VOA in Mandarin. Excellent signal with almost no sign that Voice of America is underneath. 1159: Very good signal from Radio Mashaal in Pashto on 15760 kHz. Traditional music from the region. 1230: Fair signal from unidentified station, playing Arab pop music on 9550 kHz. 1 kHz test tone at 1236, followed by the station sign-off. Please check other alternative frequencies 15170, 15175, 15180. TAIWAN(non)   PCJ Radio International will celebrate it's 5th Anniversary. Please check other alternative frequencies from 15155 to 15180. Changes between frequencies vary from 3 to 5 minutes. # strong co-ch Radio Farda in Persian till 0300 and STANAG#4285. * co-ch RTTY. This frequency is not registered in HFCC database. A special QSL will be issued for this broadcast. Source: PCJ Radio website. Unscheduled transmission of Voice of Armenia in GREEK language! # co-ch Radio Farda in Persian till 0300. * unregistered frequency in HFCC database. Both frequencies are blocked from the RTTY.